Roerich and I have been discussing this tower back in the day, the basic idea was to make this the permanent residence of an old, rogue-like wizard, similar to Baladas Demnevanni in Arvs-Drelen. He shouldn't be hostile initially - I'd rather like to see this as a part of a significant quest or questline, being the main reason why players would travel to the top of the mesa. I imagine he'd be interested in Direnni artifacts, sort-of analogue to Divayth Fyr, and it might be necessary to impress him by bringing a unique piece from Anga Tor as a gift to make him talkative. Can I claim this? I've been playing with a mock-up of this, and think I might me able to do something with it. By the way, I plan to include a basement so that the mage has a place to live. I tried to make it somewhat visible in the exterior that this tower was part of a larger Direnni complex, a small fort nearby Anga Tor. I wouldn't mind if that basement was somehow connected to the actual fort (which doesn't have an interior claim, so this would be the only trace of it), but it should be blocked off by rocks at some point. It should be small enough so that the focus is still on the mage's place. Just a suggestion, anyway. If you had other things in mind, go ahead; just brainstorming. Doesn't actually need to have a connection to the rest of the fort. Excellent. 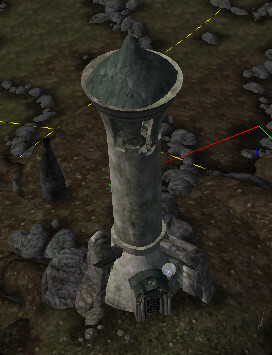 Another perfect reference would be the tower of Sorkvild the Raven. It's up to you whether this should be a Breton, Nord or Altmer wizard. I used T_com clothes because an Altmer or Breton wouldn't look right with Nords' clothes. Last edited by Iskuss1418 on Wed Nov 15, 2017 11:16 pm, edited 1 time in total. Screens looked really good on discord. Thanks, the set was kind of hard to get used to at first, but I got used to it. Update: Fixed top part of tower not grid-snapped correctly. I fixed it a while ago, but wasn't sure if it warranted an update since it would've probably been found in a review. I thought I'd save the reviewer some time though and upload the fix. Fixed the top few tower pieces not being gridlocked correctly. Replaced the makeshifting at the top of the tower with the 'proper' method. Last edited by Iskuss1418 on Wed Jan 24, 2018 4:56 am, edited 1 time in total. To be fair, Mirilstern does it that way 2-3 times. -Also (as you probably know already, I'm just being clear) this wasn't a 100% review, just a minor fix. But I didn't notice anything else weird, although I wasn't looking that hard. Illegal to Sleep Here: Set, I unset this. Finally, an old cheesewheel to replace! Looks like this is no different in terms of other Direnni interiors with the key stuff. Not ready to merge. Merged with Dragonstar Section File. Sunk exterior door to match the interior one being shorter.